Ru wares are among the rarest of Chinese porcelains, for they were produced only for about 20 years. They are named after the famous Ru kilns in Henan province, not far from the Northern Song dynasty's imperial capital of Kaifeng. They are known for their pale bluish and greenish turquoise glazes. There is usually some slight, deliberate crackling of the glaze. This immensely rare stand bears the incised inscription Shou Cheng Dian or Hall of Perfect Old Age, found also on a Ding ware dish in Taipei, which some specialists say is the original inventory mark of a Song palace pavilion. 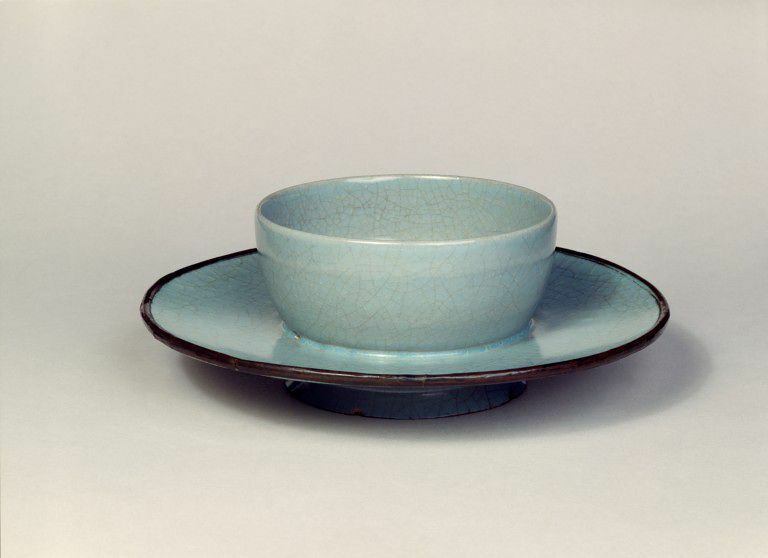 Stands of this form were made for use with tea bowls, and it may well have been handled by the Emperor Huizong (reigned 1101-1126), for whose court much Ru ware was produced. This Emperor was a great tea enthusiast, and even wrote a treatise on the subject. A shallow cup-shaped stand, with curving sides vertical at the lip, having no base and set on a wide-spreading, tapered, saucer-like ring-flange with concave upper surface, straight-sided beneath and rising from a low spreading foot. The flange has been ground at the rim and the edge bound with a ring of copper. The foot has also been cut down to some extent and the rim is ground flat. The body would appear to be of warm buff colour and is hard enough to possess resonance. 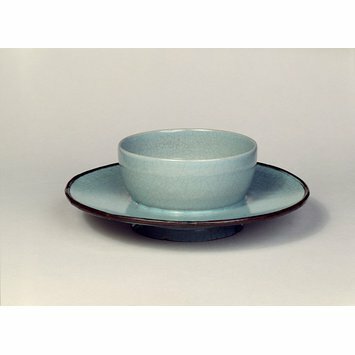 The glaze colour where thick is almost cerulean, but its effect is modified by dark staining in the broader lines of the crackle. The neatly incised inscription just within the foot is picked out in red pigment. Kerr, Rose. Song Dynasty Ceramics. London: V&A Publications, 2004. pp. 26 and 30, nos. 18, 18a and 18b.